Lizzy and her sister, Rose, had known for a long time that the people they called Mum and Dad were not their real parents. Mr and Mrs Baxter couldn't have children of their own. They had adopted Rose when she was one, and a few years later they had adopted baby Lizzy, too. As soon as the girls were old enough they had told them the truth. Rose's parents had been killed in a car crash. The Baxters knew their names and where they had come from. But with Lizzy, it was different. She had been found abandoned when she was only a few months old. No family could be traced, so she was taken into a children's home and put up for adoption soon afterwards. And, strangely, the place where she had been found was not far from this town. It was sheer chance that she had come to live in the area again. Dad had been offered a post at the new university in Cornwall, and all the family had jumped at the chance to live by the sea. Dad and Mum had wondered if coming here might make Lizzy feel uncomfortable, but it didn't—quite the opposite, in fact; she had wanted to come. The lighthouse beam swung round again, gleaming on the sea's surface and turning it briefly from midnight black to shimmering silver-grey. Lizzy blinked as a funny little tingling sensation moved in her stomach. The quiet harbour, the ever-turning light… Might she have seen them before? She would have been too young to remember, of course. But could it be the reason why she just knew she was going to be happy here? She put a hand to her throat, and her fingers closed round something that hung there on a silver chain. It was a locket, made from mother-of-pearl that shone with rainbow colours. It had been around Lizzy's neck when she was found, but no one knew who had given it to her. Lizzy pressed a tiny catch and the locket opened like the two halves of a shell. Inside was a single curl of hair, the same bright, pale blonde as her own. It was a very unusual colour, and everyone else believed it must be Lizzy's. But Lizzy secretly believed the curl of hair belonged to her mother or father, and in her mind it was the one link she had with the parents she had never known. Lizzy closed the locket and let it fall back on its chain. She waited until the lighthouse beam had flashed round once more. Then she left the window and climbed into bed, snuggling under the duvet and closing her eyes. Within two days the whirl of unpacking and putting things away was over, and Lizzy and Rose had time to start exploring their new surroundings in earnest. At first they went out together, getting to know the layout of the town. But although the two girls were good friends, Rose at fifteen was four years older than Lizzy, and what she really wanted was to make new friends. Especially boys. Lizzy wasn't exactly a nuisance, but Rose had her own kind of exploring to do. So it wasn't long before Lizzy found herself on her own. She didn't mind at all. There was so much to see and to discover that she hardly knew where to start. This wasn't a small, sleepy village like the Cornwall she had always imagined, but a working fishing port, busy and bustling and filled with activity. With summer in full swing it was crowded with holiday visitors, too, and the atmosphere was like a huge and lively fairground. The harbour was a short walk from the Baxters' new house, down through narrow streets to the foot of the hill. It wasn't a picture-postcard harbour; instead of sailing boats there were fishing trawlers crowded at the old stone quay, a big warehouse and covered fish market with fork-lift trucks running backwards and forwards, wind-tanned men in overalls and heavy boots. The mixed smells of brine, fish and diesel fuel made Lizzy's nose wrinkle, and everywhere there were gulls, flapping and diving and shrieking. And when you looked out past the crowded harbour, there was the great sweep of the bay, with the ancient castle of St. Michael's Mount standing up tall and magnificent from the surrounding sea. The whole bay was fringed with golden beaches, and the town's own beach was separated from the harbour by the lighthouse headland. Lizzy walked the length of it among the holiday crowds, exploring rock-pools and jumping over the incoming waves as they played themselves out in the shallows. There was a safe bathing area, patrolled by lifeguards. Lizzy was a good swimmer; at her last school she had been by far the best in her year. The sea was much colder than a swimming pool, but Mum and Dad had bought her a wetsuit as a 'moving in' present, and she was delighted to have the chance to use it. Lizzy was swimming in her new suit, rolling over in the waves and pretending to be a seal, when shouts from the shore caught her attention. As she stood up she saw people pointing out to sea. About fifty metres off shore were five dolphins. They were streaking across the bay, and then suddenly, as one, they leaped clear of the water, twisting gracefully in mid-air and plunging down again with barely a splash. Lizzy watched in delight and admiration, and had a sudden wild wish to swim to where they were and play with them, like a dolphin herself. A voice nearby said, 'Fantastic, aren't they?' and Lizzy turned to see one of the lifeguards grinning at her. 'They're amazing!' she agreed eagerly. For no reason at all a funny little shiver went through Lizzy as he said that. 'I'd love to get closer to them,' she said. He strolled away along the beach. The dolphins were still visible, but they were moving further away. Lizzy stared after them until the bright sun hurt her eyes. She would ask Mum and Dad about the Sea Safari as soon as she got home. Rose thought the Sea Safari was a brilliant idea, and to the girls' delight Mr and Mrs Baxter didn't take much persuading. The next day was fine, so as soon as lunch was finished they all headed for the harbour and booked on the next two-hour trip. The boat was called the Sea Lion, and it was it was the strangest boat Lizzy had ever seen. The twelve seats inside the inflatable rubber hull looked like motorbike saddles arranged in pairs. The passengers sat astride and hung on to grab-handles, while Dave Pengelly—who was very young and good-looking, much to Rose's approval—stood at the controls behind them. They found out how fast when they swung out from the harbour and headed towards the open sea. The Mount with its castle passed by on the left side, ('Port side', Dad corrected smugly when Rose got it wrong), then the engine roared into full life. The ride was exhilarating. The boat skimmed over the water as though it was on skis, and every time they hit a swell, or the wash from another boat, they seemed to take off and fly, coming down again with a jolt that sent a burst of spray glittering into the air. The wind whipped Lizzy's hair and blew salty-tasting strands into her mouth. She pretended she was riding a dolphin, and that the excited shrieks of the two middle-aged women in front of her were the dolphins' cries as they forged through the water. 'You two enjoying it?' Dad shouted over the noise of the engine. Soon, though, the wild ride was over and the boat slowed down to a gentler speed as they left the bay behind and moved down the coast, following a line of high, craggy cliffs. Rocks jutted up from the water at the cliffs' feet, and beyond the rocks were caves like dark, gaping mouths. Switching on a microphone, Dave Pengelly began to give a commentary. This was where the seals lived and bred, he told them. All the caves had names—there was Cat and Mouse, Echo Cave, and the big one just up ahead was called the Deadman. Looking at the tide slapping dark and dangerous at the entrance, Lizzy could imagine how it got its name, and shivered. Everyone looked for a glimpse of the seals as they passed the caves, but there were none to be seen. Nor were there any dolphins either, which was very disappointing. It was just one of those things, said Dave; sometimes they appeared, sometimes they didn't, and you couldn't predict. Lizzy didn't mind too much. The ride was wonderful anyway; just the feeling of being out here, with nothing but shining sea in every direction, was more than enough. It was the dolphins. They came streaking towards the boat, sunlight glinting on their backs. They were moving so fast that Lizzy thought they must surely crash into the side of the Sea Lion. But at the last moment they swerved, then suddenly, incredibly, they were playing alongside, just metres from the astonished passengers. One leaped right out of the water, twisting in mid-air. Lizzy just had time to glimpse a silvery streak along its back before it plunged down again and dived under the boat, to emerge on the other side. Cries of delight went up, and even Dave Pengelly was staring in amazement. The dolphin with the silver streak was on Lizzy's side of the boat now. 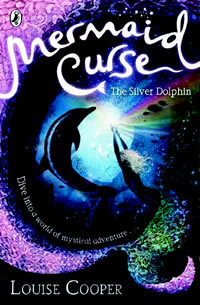 She leaned over, her eyes shining, and it seemed to her that the dolphin looked back at her. Its eyes weren't like a fish's eyes at all, but warm and intelligent as any human's. But of course dolphins aren't fish, she reminded herself,. They're mammals, just like us. As if it had heard and understood, the dolphin made a chittering noise that sounded very much like laughter. Lizzy laughed, too. It seemed that this particular dolphin wanted to be friends. In fact she could almost believe that it had come to see her and no one else. What had she said to the lifeguard yesterday? 'I'd love to get closer to them.' Well, her wish really had come true. The other dolphins dropped back as the boat headed towards land, but the silver-streaked dolphin—her dolphin, Lizzy thought, though she knew the idea was foolish—kept pace with them. It was so close that she could almost have reached out and touched it. Suddenly she couldn't resist the temptation, and she did reach out, stretching one hand towards the beautiful creature. 'Lizzy!' Mum called anxiously from behind her. 'Don't be so silly—sit up!' She grasped Lizzy's shoulder, pulling her back. As Lizzy straightened, she felt something tangle in the straps of the lifejacket she was wearing. There was a faint snapping noise, and a small object dropped from her neck and bounced on to the boat's side. 'My locket!' Lizzy's delight turned to dismay. She made a wild grab, but before she could reach it, the locket slid off the smooth, slippery rubber hull, fell into the sea—and vanished. For a moment she had an overwhelming urge to dive into the sea and try to get the locket back before it sank out of reach. But the moment passed. The locket was already gone, and there was nothing she could do. There was nothing anyone could do. The dolphins had turned back out to sea but Lizzy didn't watch them as they speeded away. All she could think about was her locket. It had been her only link with her real parents, and now it was lost for ever. The family all tried to console her, but she was too heartbroken to be comforted. Besides, what could they say? No words could make any difference.